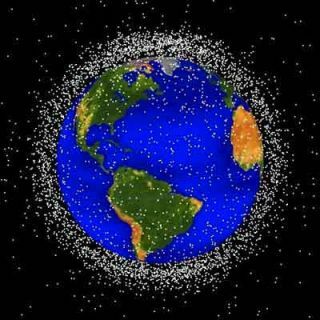 Human-made clutter jamming up the orbital byways is a troublesome issue. Launchspace, a training organization for space professionals, based in Bethesda, Maryland is keen on trying to find new ways to battle the bits of space flotsam. They've been asking for suggestions on how to solve the space trash problem. So far, ideas submitted have fallen into two main categories: limiting new debris through such means as de-orbiting mechanisms integrated into the design of future satellites; and eliminating existing space debris. The space junk problem continues to increase, due to collisions between space refuge, rocket stage failures, even purposeful trashing of Earth orbit by anti-satellite testing. A popular concept suggested involves utility satellites such as "garbage scows." Such spacecraft can maneuver up to single debris pieces and snag one at a time. These space garbage scows could be robotic or piloted and would eventually de-orbit themselves for disposal or later reuse. Create a financial prize for some entrepreneur to retrieve debris. Build a football field-size drag net using multiple satellites to maintain tension. Populate space with passive devices, such as sweepers or giant ball-like contraptions that absorb clumps of junk. Bob Russo of Launchspace Training told SPACE.com that they are on the lookout for new solutions to the old and persisting problem. "Even though recent efforts have been successful in minimizing the amount of new debris, the number of debris pieces continues to increase," Russo explained. "If space-faring nations continue to ignore this growing space access challenge, we will reach a gridlock situation in which launching satellites is too risky. Thus, a space cleanup is inevitable," he said. Given all the ideas, what then? "Launchspace has received a number of creative responses to our request for answers. Over the next few months, we will be issuing comments and assessments about realistic ideas," Russo added. "Our objective is to raise awareness to this potential future denial of space applications and exploration." Got you own idea how to solve the mess in space? Send it along to: Training [at] launchspace.com.